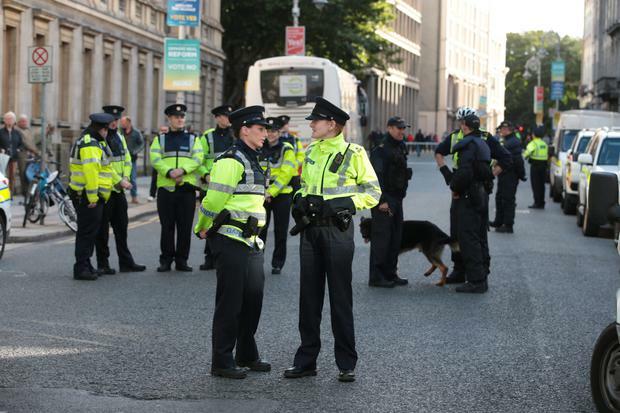 A SPECIAL garda team headed by an inspector has been set up to investigate violent clashes during street protests in the centre of Dublin. The team has been tasked with trawling through footage taken from CCTV cameras in the areas where groups of protesters confronted gardai at crush barriers. Gardai said up to 600 people had taken part in the protests. But more than a hundred protesters broke away from the main group and clashed with gardai outside Leinster House and on O'Connell Bridge during the evening rush hour. Three people required hospital treatment as a result of the disturbances, two were suffering the effects of pepper spray, while a third person was injured on a barrier. Among the groups represented at the demonstrations were the 32 County Sovereignty Movement, Republican Sinn Fein, Eirigi and Republican Voice. At Leinster House, officers used pepper spray on protesters who were trying to push past the garda barriers. Files will be prepared for the Director of Public Prosecutions after officers examine CCTV footage. Meanwhile, Transport Minister Leo Varadkar described the protesters who blocked commuter traffic in Dublin as "a disgrace". He condemned the actions of a small few who obstructed buses and cars from crossing O'Connell Bridge on Wednesday evening. He claimed that some elements of the crowd were "hell-bent" on causing trouble for gardai. Thousands of people were forced to get off buses and walk as the capital came to a standstill during the protests which also included demonstrators blocking the Luas line preventing trams from getting into the city centre. Mr Varadkar said that the actions of a few were disgraceful. "People have a right to protest but they should do so responsibly, and peacefully. "There were a few who were just hell-bent on a fight with the gardai, and I'd like to particularly thank the gardai for how well they handled the situation." The first O'Connell Bridge protest lasted for about five minutes, but after marching up O'Connell Street the protesters returned and blocked the bridge for over an hour. Other marchers staging peaceful protests included residents from the controversial Priory Hall development as well as campaigners against austerity measures.